Our Tuscan Seasoning is as delicious as it is beautiful with its bright shades of wheat and green accented with bright, red pepper. The aroma of cool rosemary and nutty toasted sesame will make you close your eyes and imagine the flavor and the first bite of Tuscan Roasted Chicken will deliver the satisfying flavor of this seasoning blend. 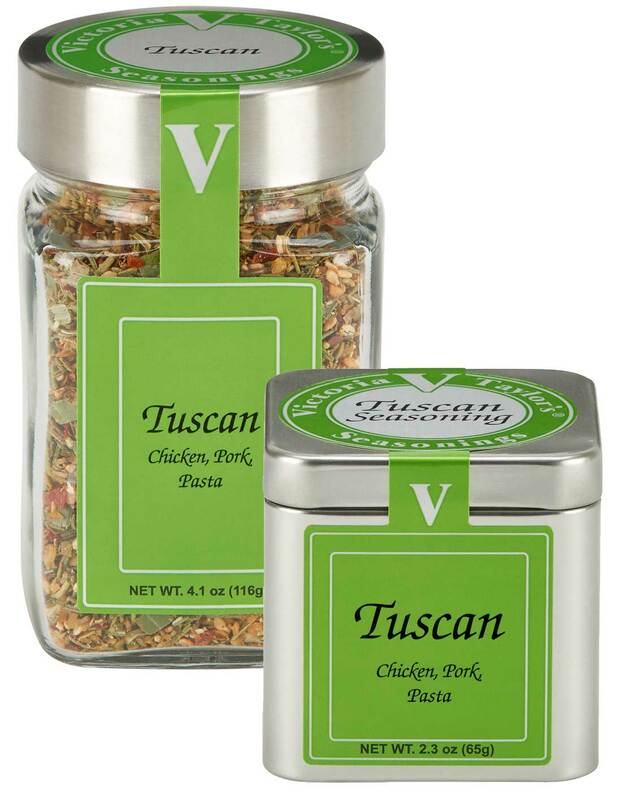 Victoria's Tuscan Seasoning is a natural for pasta dishes and is also great in veal and pork dishes such as Stuffed Tuscan Pork Loin Roast. Vegetables (garlic, bell pepper, green onion), mixed spices (rosemary, oregano, red pepper flakes, black pepper), sesame seed, lemon peel, sea salt, sesame oil, rosemary oil. A friend of mine gave me a box of goodies for Christmas and one of the items was a jar of your Tuscan Seasoning. I am absolutely delighted with this product and wanted you to know how much I am enjoying it. It is wonderful! Miss Victoria Taylor, We received the ‘Tuscan Seasoning’ as a gift and are truly elated with it. We use it with almost everything we create! I cannot recall enjoying such a strong - yet subtle – flavor in a blended spice mix. We applaud you on your business, have signed up for the catalog and look forward to enjoying all you have to offer.